The forest of western Oregon are among the most beautiful, magnificent and varied in the world. Oregon's rain forests are lush as a result of the large amount of rainfall from the mild, humid Pacific Ocean current flowing along its coastline. This oil painting depicts an Oregon rain forest, which is largely coniferous, showing Douglas Fir, Western Red Cedar, West Coast Hemlock and Western Yew. In this painting you will find Vine Maple, Rhododendron, Sword Fern, Lupine, Fairy Slippers (also called Lady Slippers) and Beargrass; Beargrass usually grows in open forests and clearings. Its leaves are 1' to 2-1/2' long and very narrow. Indians used the leaves of Beargrass to weave garments and baskets and ate the roasted rootstock. Oregon forests offer unsurpassed natural beauty; for hiking, climbing, camping, fishing, hunting, skiing, etc. Oregon forests also offer financial opportunity in its trees - America's renewable resource, offering a host of products made from wood. 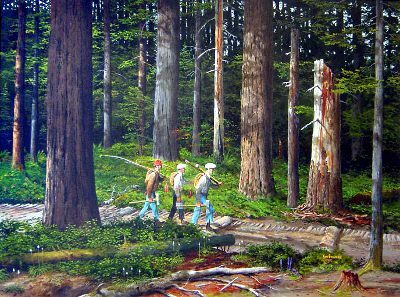 This scene also shows loggers of the early 1900s walking out of the woods on an old skidrow. These roads were built in the days of horse and oxen logging, constructed of small logs to ease the drag of the logs being pulled by the animals and to keep the logs from miring down in the mud. The tools being carried by the loggers are: Springboards; usually 2" x 8" -5' to 6' long, rounded at one end where a half-moon sharpened, knife-edged steel blade was attached to bite into solid wood in the notched tree trunk; they also carried crosscut saws, and bottles of kerosene used to free saws of pitch, sledges for driving wedges and a can of kerosene. The packs were used for lunched, extra wedges, miscellaneous tools, undercutters (for the buckers) drinking water, etc. Oregon State University has one of the leading schools of forestry in the world and students from countries throughout the world are represented here.